MP4 Joiner has been replaced by MP4 Tools (Joiner and Splitter). It is a user-friendly set of tools which allows you to join and split MP4 files without needing to reencode and without affecting sound quality. 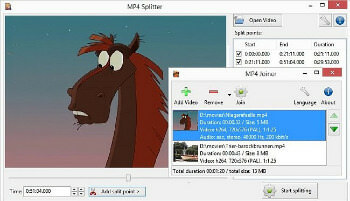 MP4 Joiner was designed for the average user, and it doesn’t have any complex options included. Any beginner can merge MP4 files using this application. The interface of MP4 Joiner is simple and intuitive and you can add MP4 files to the task list using the file browser or the drag and drop feature. You will constantly have access to extensive information about the imported MP4 files.